When I first moved to Los Angeles, I not only founded Coalition Technologies but I also founded a flag football group that plays on the beach directly out front of my original home office. After the first year, I had grown the flag football group to around a hundred total members and we had 20 or so people consistently show up for games. Once I moved from that original home office to our new office in Marina Del Rey, I gave the group to Rich the biggest regular player and haven’t been able to play again since I have been so focused on Coalition. Rich has since grown the group to 932 members with 70-90 people showing up each week to! It has even spawned a big spinoff group that plays in Santa Monica! 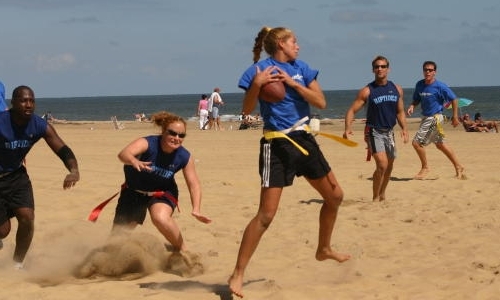 Pretty awesome to see the growth of beach flag football, a super awesome sport that I was able to launch here in LA. Great article about CT and your role as CEO. They left out the part about you also founding one of the fastest growing Meetup groups on L.A. as well. Don’t know if you noticed but we are nearing 1000 members! You will always be recognized for your contribution here as long as I am around. You should be proud of so many accomplishments. We are going to have a Summer Season Pep Rally/Kickoff at a local Venice establishment in a few weeks to coincide with our 1000th member attainment. Would you be available as a guest speaker? It will likely be on a Saturday afternoon around 3:00 (after football). Somewhere around the end of the month. We are at 932 members right now so it will take a while before we get close to 1000. I’ll keep you posted! My fantasy football team is in the semi-finals of the playoffs chasing after the $360 first place prize. In my current match up I am ahead by only 4.1 points and my opponent has a defensive player yet to play on Monday night football. 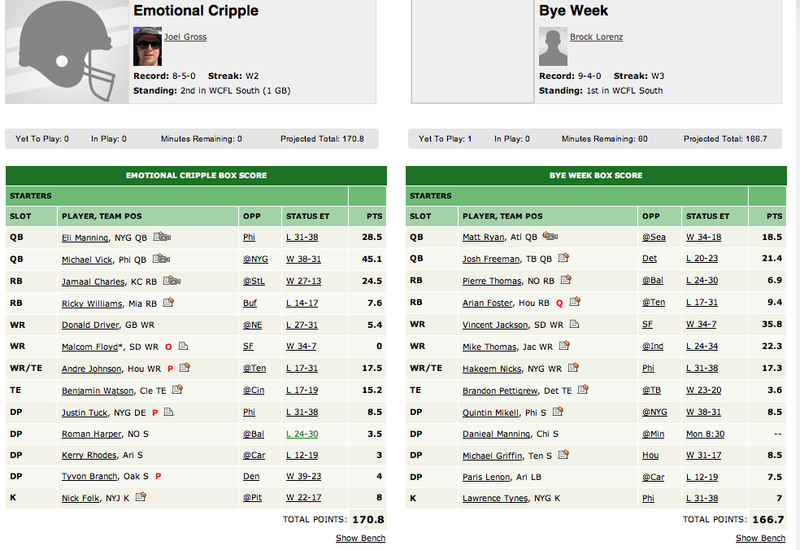 Current score is Emotional Cripples 170.8 to Bye Week 166.7. Defensive players usually score around 7 points… so I need to get lucky here to win it. Cyclone – this play is designed to provide even spacing between receivers and keep people moving..‚ There should always be a receiver open or about to be open.‚ It will mostly come down to Ole looking for an open space and waiting for a receiver to enter it. Reversal of Fortune – this is a quick rollout to the left with an overload of receivers on that side.‚ The one receiver at the bottom left is a safety valve.‚ If Ole can’t find anyone he can pitch it to the receiver who is sprinting to the right.‚ Then all the receivers should shift and head right. 4th of July – we discussed this last week.‚ Everyone is doing quick button hooks (3 going short and 3 going long).‚ ‚ Receivers will turn the opposite way‚ that‚ their defender is playing them.‚ Make sure you look for the ball quick and go towards the ball. Space Invader – it just looks like a Space Invader.‚ Anyway, combo of a couple plays we run.‚ The 3 middle guys go really short.‚ The 4th one runs to the back and cuts.‚ The two outside receivers go to the back of the end zone then cut to the front cones. 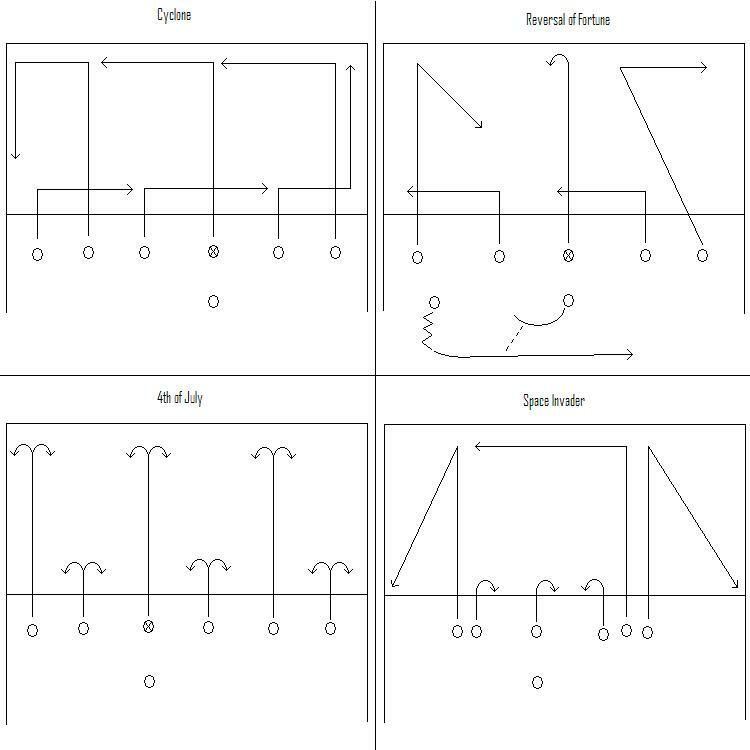 The two most effective plays in my opinion are the Cyclone (it is constant crossing routes which chops up flag football defenses) and the Space Invader (confuses opposing defenses and usually will be open on the corners). A very close game tonight. Our team scored and took the lead with 7 seconds left, and the other team did a Hail Mary pass and one of our guys got called for pass interference. With no time on the clock, the other team had a chance to score from the 1 yard line… and we stopped them! Lots of fun. The parents of children playing in a youth football league had a huge brawl on the sidelines. The fighting is vicious and very violent. Watching this football parents fighting video made me sad. You can hear some kids crying in the background because of the madness that happens. If you watch the video closely, you will see a one fat fighting white dad running around in a boxing pose… he was just trying to hurt people. Very trashy, classless people do this in front of children. I hope that the football parents fighting in this video got some prison time and perhaps their children taken away from them. The parents fighting at a youth football game video below is even more awful, because the COACH is the one who started it. The coach of the PeeWee football team, Robert Watson, had been arguing with the 18 year old ref about a call when the 18 year old ref threw him out of the game. Instead of being a man and going away, Coach Robert Watson assaulted the ref and knocked him unconscious. A parent who was nearby jumped on the coach and the rest of the parents rushed in fighting and brawling. If you watch closely, you will see one woman sneak up behind the pile of fighting football parents and kick someone trying help into the melee. Or you can see the fat disgusting football dad in the red shirt trying to dive in and fight. Where do these people come from? Who in their right mind thinks that you should get so wound up at a kiddie football game that you have to go fight and brawl? Ugh. Makes me sick. Coach Robert Watson should be put in prison for a very long time for knocking out a young ref like that. 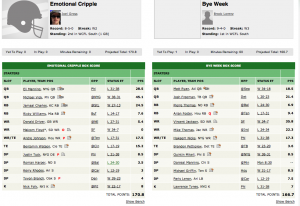 I am playing in a fantasy football league with a bunch of friends from high school. Our commissioner, Bryan Terhune, has never been one much opposed to cheating. We had multiple classes together in junior high and we would work together on algebra 1 tests. When the teacher suspected us and put us on opposite sides of the classroom, we would hold up signs with the answers to each other. I am not sure how some other student didn’t turn us in, seeing as it was a Christian school lol. Anyways, Bryan has been up to his old tricks. He convinced another friend of ours in the league, Shawn Sturzen (who doesn’t know anything about football) to trade him one of the best running backs in the league for a terrible wide receiver. The commissioner’s job is to guard against unfair trades, not go out and do them himself. It was only after much uproar from everyone in the league that he reversed the trade. I guess it is better to ask forgiveness than permission. I’m playing in a fantasy football league with my friend Josh Cochran and he keeps coming up with new rules and regulations, so I decided to come up with a few of my own and send them out to the league. Here they are. 1. A) Any GM not paying on time should receive 40 lashes from a “cat o’ nine tails” whip. 1. B)League commissioner will be responsible for the administration of this firm, but fair rule. In cases where league commissioner does not pay on time, each member of the league will personally administer 5 lashes. 2. Any GM suspected of making an unfair trade shall report before the WTO commission for sanctions. 3. If a GMs player commits a legal infraction (dog-fighting, betting, drug dealing, murder, etc. ), that GM will be suspended for a length of time to be determined by the league commissioner. The purpose of this regulation is to promote the image of the league and ensure good hygiene. In cases where the league commssioner violates this rule, he shall by lynched by an unruly, vigilante mob. 4. Any GM who willfully defeats the Emotional Cripple’s team shall be subject to immediate, unprejudiced termination. 5. Any GM caught complaining about Regulations 1-5 shall be subject to $50 fines, payable to Emotional Cripple’s team. Please cast your vote by emailing the League. DON’T BOTHER READING THIS UNLESS YOU ARE IN THE WCFL… boring stuff. Josh: Keepers will remain unchanged this year, b/c teams based their drafts this year off of the current rules. After playing this year, if we want to change the keeper rules, we can discuss it next year, before the next draft. The champion this year will become the commissioner next year. If you don’t submit the 2 red-shirts to Dan by Sept 1st, you don’t get them this year. Joel: Please redshirt Tarvaris Jackson and Chris Henry for me (Emotional Cripple). Also, what happens if I want to play a redshirt guy this season? Josh: 1. We add keepers, not for this year, but for next year. 1 RB and 2 WR. Thoughts?? 2. We change commissioners, bookies and record keepers each year. Craig once worked for foxsports (and may still). He’s a renowned fantasy baseball guru. Not sure if he knows much about the pigskin…i guess we’ll find out. Thank you for coming tonight Craig. Hey Craig! Welcome aboard, glad you got in! Prepare to be gutted like a fish.